Malacetic There are 2 products. 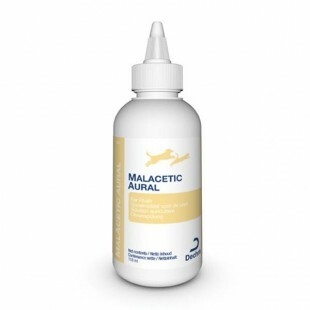 Malactic Aural is a unique, all natural, environmentally sensitive solution designed for routine ear cleaning and drying. Malacetic Aural is an antibacterial antifungal ear flush. Useful in maintaining a healthy environment in the ears, especially in dogs that swim. Useful where bacteria and yeast have been identified on cytology. Directions - Shake well before use, apply to ear and gently but firmly massage the base of the ear. Use a cotton wool ball to remove excess solution. Repeat as necessary. Close cap tightly after use. 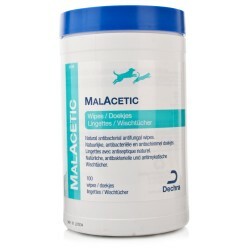 Malacetic Otic Wipes are handy wipes that contain the unique DermaPet formula of 2% acetic acid and 2% boric acid.